Pear shaped engagement rings use an elegant and sophisticated gemstone cut that forms a hybrid between the marquise and oval cuts. One side of the pear shaped diamond is rounded like a oval while the other side ends in a point like the edge of a marquise diamond. The result is an elegant sparkling teardrop that is at once sophisticated, alluring, and feminine. Not surprisingly, the pear shaped diamond cut is commonly known as a teardrop cut and sometimes also called a pendeloque cut. Searching to Buy Pear Shaped Engagement Rings or Loose Diamonds Online? James Allen is the Best Online Source for Pear Shaped Engagement Rings with 3d images of every ring. What is the Right Way to Wear Pear Shaped Engagement Rings? This is one of the most common questions asked about the pear shaped ring. In short, there is no 'correct' direction for a pear shaped diamond to be pointed. It is slightly more common to wear it with the pointed edge facing outward towards the end of the fingers. This direction allows the shape of the gem to accentuates the beauty of small fingers, making them appear more slim, long, and elegant, like the diamond itself. On the other hand, when the wide end of the gem points out, the stone can appear larger. It is even possible to get a pear shaped ring with the stone set perpendicular to the fingers. It all depends on what will best match the style of the wearer. The teardrop cut is not as flexible as a round cut and does not have as many options for ring settings. The two best options are the six-prong solitaire setting and the fancier pave setting. The six prong setting has two prongs on either of the wide ends, one at the point, and one at the rounded oval end. This setting is both simple, elegant, and beautiful. It is also the least costly. The fancy pave setting has the single large pear stone surrounded by numerous smaller round stones. Another beautiful setting for pear shaped engagement rings features the main teardrop diamond parallel to the fingers with smaller pear, round, or marquise stones facing out, perpendicular to the fingers (parallel to the ring band). Two popular settings for Pear Shaped Engagement Rings. On the left, the 6-Prong Setting and on the right, the main pendeloque stone surrounded by smaller diamonds in a Pave Setting. When searching for pear shaped engagement rings the cut of the diamond (or other gemstone) should be the most important consideration. Typical length-to-width ratio for tear drop diamonds should stay within the 1.45:1 up to 1.75:1 range (or by more conservative opinions, 1.50 through 1.70 respectively). The wide end of this range is closer to an oval cut while the more elongated cut is more like a marquise. 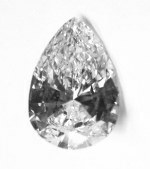 Teardrop diamond with a significant bow-tie effect. With the teardrop cut, there are two important sets of defects to avoid. First, the phenomenon known as the bow-tie effect where a butterfly or bow-tie shaped shadow is visible near the middle of the diamond. Be aware that most long diamond cuts (including Marquise cuts) will usually have some small degree of bow-tie shadows from certain angles and lighting conditions. However, if the effect is very strong, and visible in most or all lighting and angles, this is not a good quality cut. The second potential set of defects for diamonds in pear shaped engagement rings are known as 'high' or 'uneven' shoulders. These are actually two separate but related defects. Uneven shoulders for a pear shaped diamond occur when the arch at the wide (oval) end of the teardrop is cut so that one side bulges more than the other. High shoulders is a similar defect where the same rounded end of the teardrop is cut more like a rounded edge of a square rather than oval. Both of these issues are rare but usually intentional and sloppy defects where the cutter has sacrificed symmetry and cut in order to maximize raw carat weight. However, uneven and high shoulders can be easily seen to the naked eye. To avoid them, the teardrop cut should always have a gentle rounded and perfectly symmetrical arch around the widest section of the gem. If searching for pear shaped engagement rings online, be sure the merchant has either a good reputation or sufficient return policy (both usually go hand-in-hand). In any case, a reputable gem source (like Blue Nile) will never carry defective pear shaped diamonds with significant bow tie effects or high and uneven shoulders. Also, it should be a pleasant surprise that pear shaped engagement rings are less costly than the round brilliants because a quality teardrop cut is simpler to create.